Maria Costello to appear at SuperBike Live! 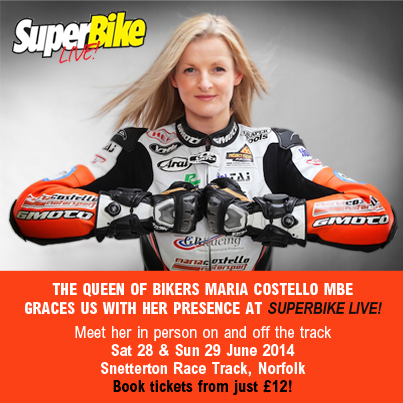 We’re thrilled to announce that the queen of bikers Maria Costello MBE will be attending our SuperBike Live event on June 28th/29th at Snetterton Circuit. Maria will be taking to the 300 Circuit throughout the weekend for some demo laps as well as mingling with SuperBike Magazine fans at the event.